Despite Lynn’s gritty image, Laurence Elizabeth Howard is convinced her new vintage store on Exchange Street will take off. Howard, a 54-year-old Marblehead resident, is the owner of Pick Up Modern & More, which opened on Monday in the city’s Downtown Cultural District. The store buys, sells and consigns antique and modern collectables. “I’m basically the one who says, ‘that’s not a $300 brass lamp, it’s an $11,000 brass lamp,’” Howard said. The name of the store comes from its eclectic inventory, which features items such as a Herman Miller table for $750, a George Hunzinger lollipop chair for $675 and a set of 1940s bookplates for $10. 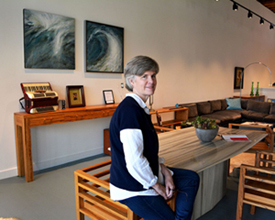 Pick Up Modern & More owner Laurence Elizabeth Howard will display the works of Jackie Singer of Nahant and other local artists in her new store in downtown Lynn. Her store will face competition from a number of other retailers including Treasures Too Consignments and North Shore Furniture, both on Union Street, W.F. Healey Co. on Western Avenue and R & B Consignments on the Lynnway. Howard said she plans to distinguish her shop by providing expert guest speakers to teach customers about topics such as home decor. Born in Argentina, Howard has been a North Shore resident for about 50 years. As a child, she attended church in Lynn and developed a love for the city and its rich culture. “Right at street level there’s a multitude of ethnicities, that diversity is something that I really wanted to be a part of,” she said. Howard purchased the building with her mother last fall for $280,000. It needed lots of work since it had been vacant for 15 years. There were pigeons and appliances that needed to be removed prior to renovations, Howard said. Not only that, she said the building lacked electricity or plumbing. Prior to opening the shop, Howard worked as broker for Fidelity Investments and also served as a retail banking officer at the shuttered BankBoston. The launch of the store was on her bucket list. A friend recently suggested she open a discount store, but Howard declined. She said Lynn deserves more than another off-price shop. April 19, 2016mark.sutherlandLynn, NewsBankBoston, Dillon Durst, Downtown Cultural District, Exchange Street, Fidelity Investments, George Hunzinger, Herman Miller, Laurence Elizabeth Howard, Lynn, Marblehead, North Shore, North Shore Furniture, Pick Up Modern & More, R & B Consignments, Treasures Too Consignments, W.F. Healey Co.